Doha/Qatar, 15 Apr: Mangalore Cricket Club (MCC), Qatar in its effort to promote Konkani language and culture, will present two Konkani dramas at DPS Modern Indian School Auditorium, Al Wakrah, here on April 26, as part of its mega cultural programme to mark their 27th anniversary. Arun Raj Rodrigues is the playwright of the much-acclaimed Konkani comedy plays, Budtugol and Paying Guest. 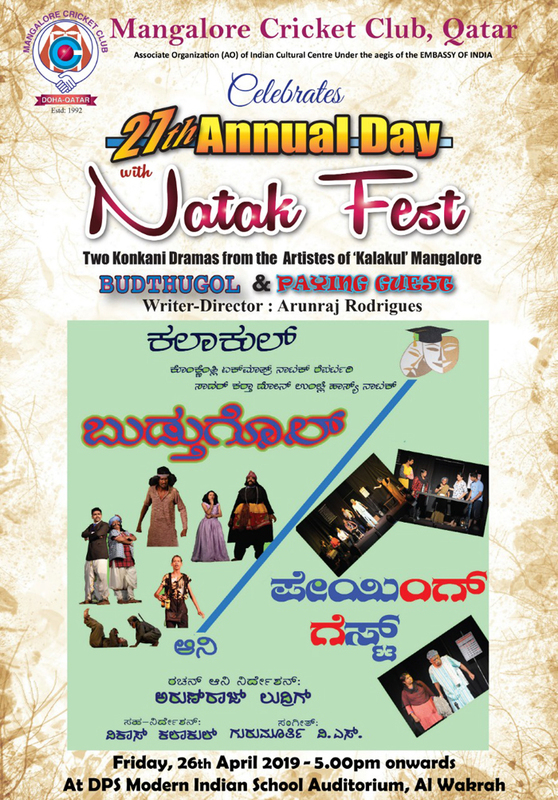 The plays will be performed by ‘Kalakul’ Konkani’s lone professional repertory (troupe) promoted by Mangaluru-based Maand Sobhann. Talented and renowned artistes are likely to mesmerize the audience with their electrifying performances on the stage for nearly three hours. As Konkani plays are making a major comeback in modern times and sensing the pulse of the people and their eagerness to watch quality Konkani plays, Mangalore Cricket Club (MCC), has taken a bold step to entertain Konkani theatre loving people of Qatar by staging these twin plays. Both plays have received high acclaim from all over when they were staged earlier. The twin plays will definitely capture the hearts of Konkani theatre lovers and MCC is confident that it will be appreciated for this step towards promoting Konkani language and theatre. All Mangaloreans are invited to enjoy rich Konkani culture through these dramas.